The chances of young female cancer patients having a baby later in life may be improved because of a technique developed by scientists in Edinburgh. 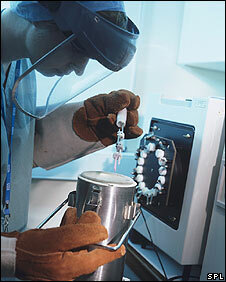 The researchers have devised a way of growing human eggs in a laboratory. It could lead to immature eggs being stored and subsequently developed, fertilised and implanted into the womb. As well as preserving the fertility of females undergoing chemotherapy, the technique could increase the number of eggs available for stem cell research. Young women who are diagnosed with cancer can be left infertile by chemotherapy. Currently, doctors remove a piece of their ovaries and implant it later in life, but this runs a risk of reintroducing the cancer-causing cells into the patient. The new technique, developed by experts at Edinburgh University and the city's Royal Infirmary, means the patient's eggs could be developed to maturity in the laboratory until they are capable of being used in IVF treatment. This would avoid the need for a tissue transplantation. Dr Evelyn Telfer, from the university's School of Biological Sciences, said: "This is a significant step in developing immature eggs to maturity outside the body. "Women who face infertility as a result of chemotherapy, or who want to put their biological clock on hold, could benefit from this system, however, there is a lot more research to be carried out before this technique could be safely applied within a clinical setting." The development could also be used as a method of obtaining eggs for the production of stem cells, reducing the need to create controversial hybrid embryos using cow's eggs. The immature eggs nurtured by the Edinburgh team remained within the small follicles in which they are found in the ovary, and which provide them with support, protection and nourishment. Dr Simon Fishel, Managing Director, CARE Fertility Group in Nottingham, said the study should provide valuable information about how to grow immature eggs outside the body. However, he added: "Several years' work will need to be undertaken to establish if developing such immature follicles in vitro offers a risk-free option for preserving fertility and a means of obtaining donor eggs. "There has been a moratorium in the UK for more than ten years on the use of immature sperm because of the feared risks associated with potential genetic dysfunction during maturation in vitro; similar concerns need to be excluded with the use of very early follicle growth in vitro before its introduction into clinical practice."